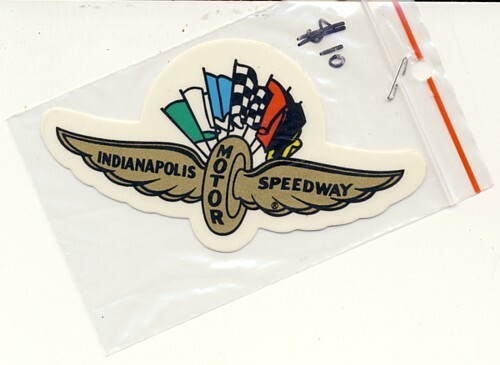 Cloth Badge ( 2 only available) $ 10 ea +P&P - Decal ( 10 available) $5 ea +P&P. Did you get yours on the day ? 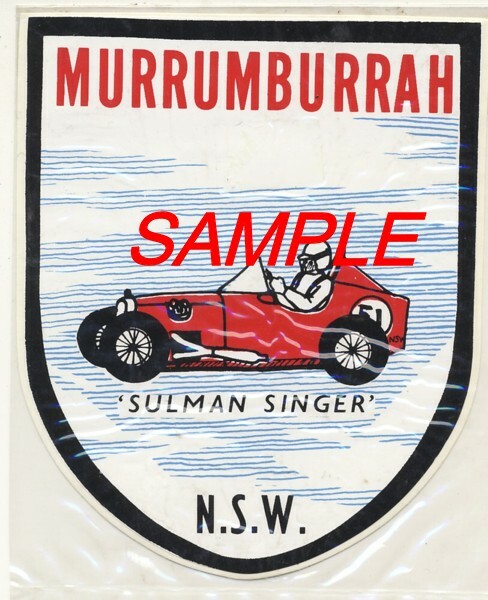 A one off decal of the famous Sulman Singer which started it's life as a Speedway midget in England - one only sealed in cellophane . 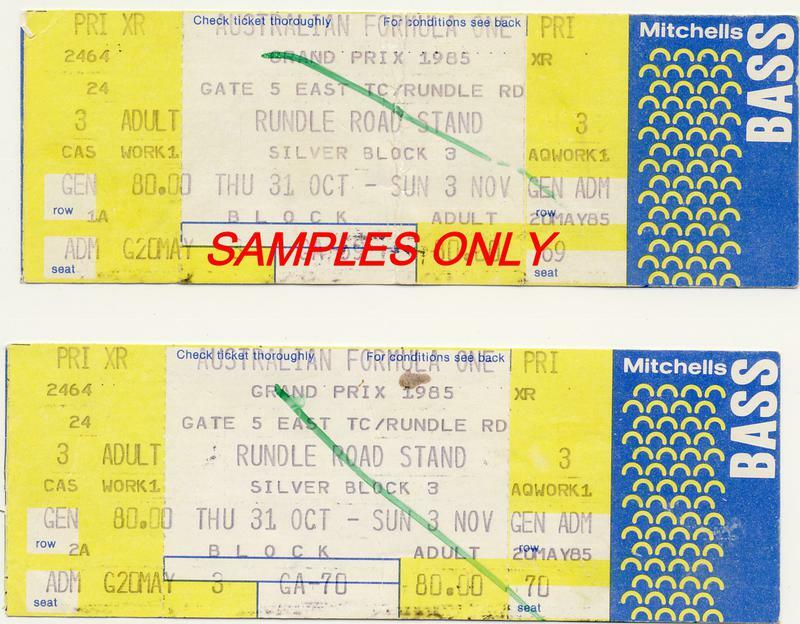 Two original tickets for the Rundle Road Straight Stand for the first ever Formula One Grand Prix to be held in Australia - Adelaide 1985. 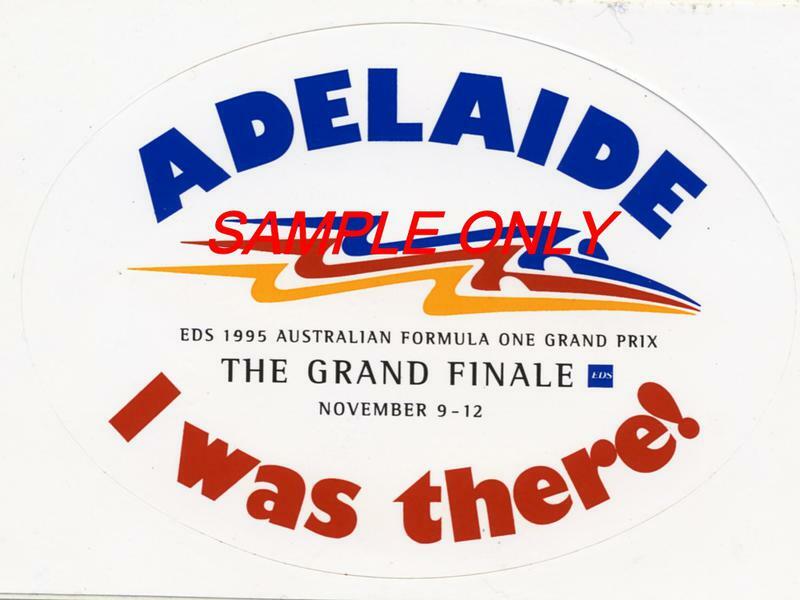 10 years later - a commemorative decal for the last Formula One Grand Prix to be held in Adelaide. $ 15 ea. +P&P. 2 available. Please check to see if still available as they may have been recently sold. Looks are deceiving as the background to the blue printing is a chrome finish - an unusual and rare decal. 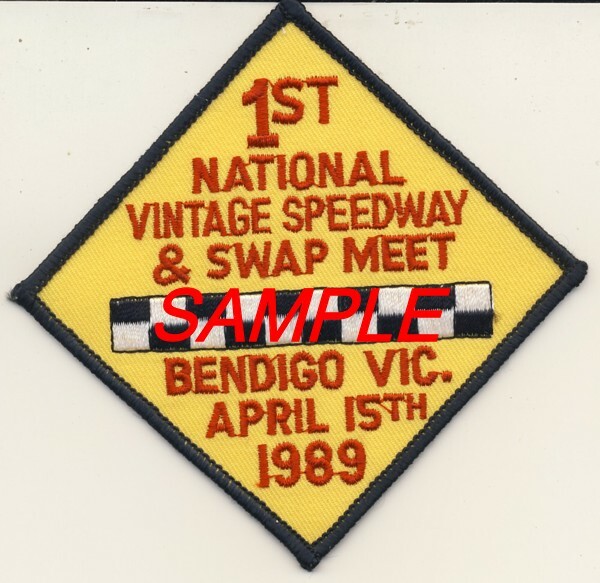 1 only - $ 15 + P&P. 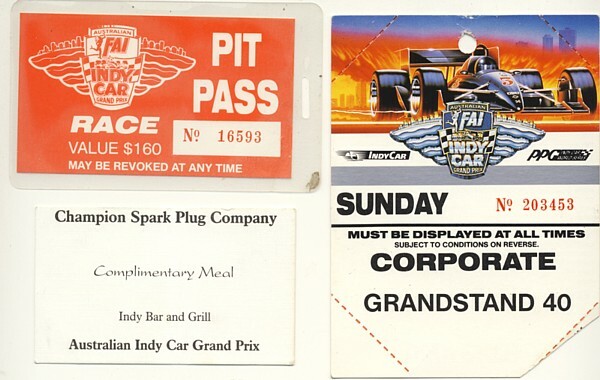 Now a rare collector item - Pit Pass - Corporate Stand Pass and Meal Ticket - Queensland Gold Coast FAI Australian INDY CAR GP - 1993. $ 40 per set 3 + P&P - two sets available. 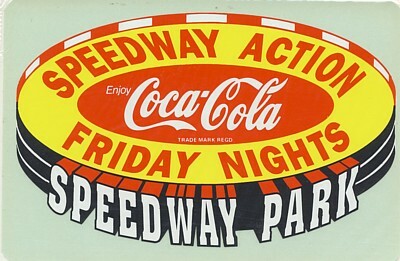 Gambler - Sprint Cars - decal - one only - yellow. 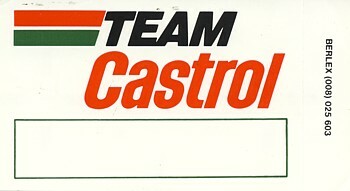 Team Castrol decal - set of 3 - $ 10 + P&P. 1 only. Size is 20 x 10 cm. 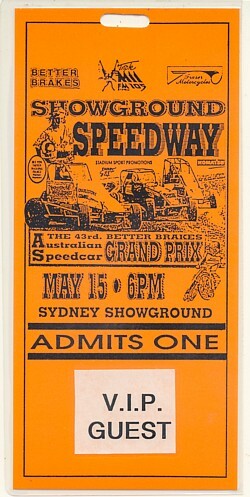 An original laminated V.I.P pass for the 43rd Australian Speedcar Grand Prix - Sydney Showground Speedway 1991. 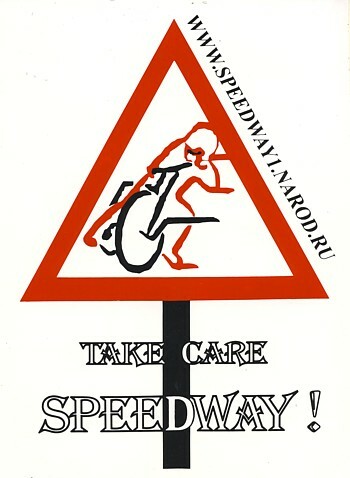 N.M.A.R. 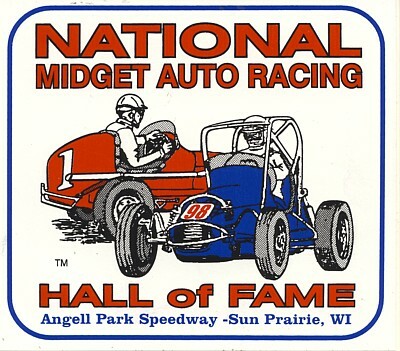 -Hall of Fame - USA - decal. 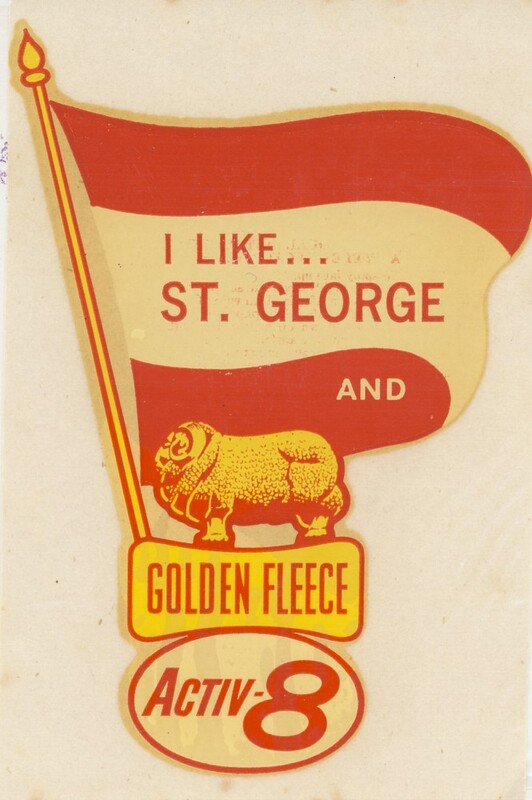 rare and one only - $ 20 +P&P . 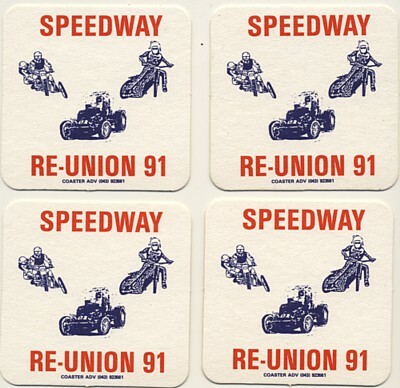 Set of 4 drink coasters from the 1st Speedway Re Union in 1991 - unused - $ 7.50 +P&P. 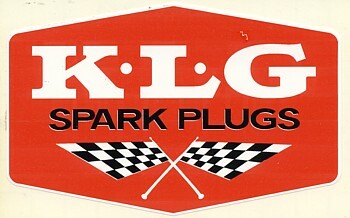 Yella Terra Cylinder Heads decal . 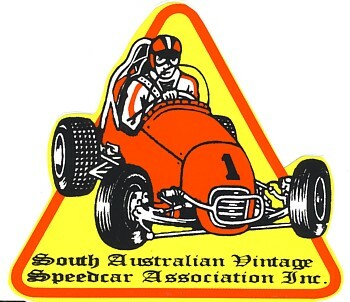 The superceded Australian Speedway Authority's decal - NASR - $ 10 + P&P. 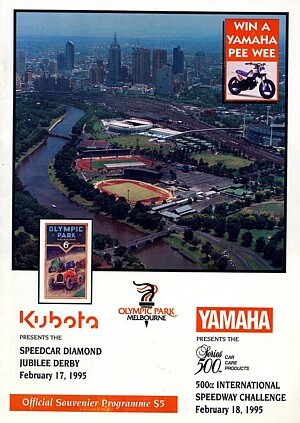 A bit of history now. 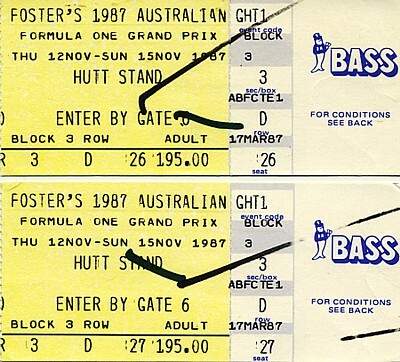 Two original tickets for the 1987 Australian Formula One Grand Prix at Adelaide - Nov.1987 - $ $25 pr + P&P. 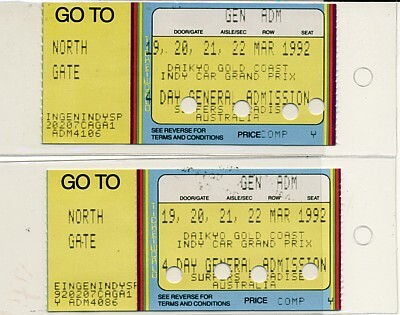 Two original tickets to the 1992 Gold Coast Australian Indy Car Grand Prix - sealed in separate plastic sleeves - $ 25 Pr. + P&P. 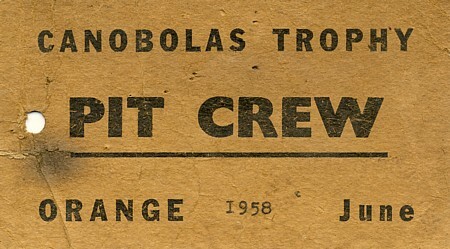 An original Pit Crew Pit Pass for the 1958 meeting at the Gnoo Blas Circuit - Orange NSW Australia for car 144 Holt Binnie MGTF/Holden. 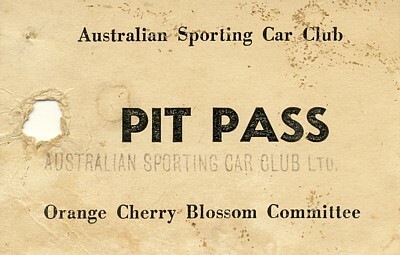 An original Pit Crew Pit Pass for the 1960 meeting at the Gnoo Blass Circuit at Orange NSW Australia - for car 144 Holt Binnie MGTF/Holden. 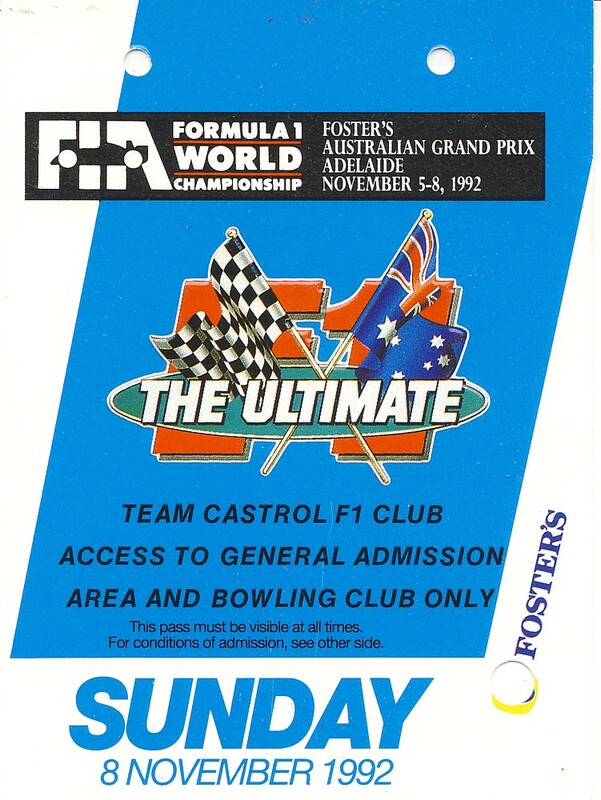 This historic meeting was the inaugural one off race for the Australian Touring Car Championship - the beginning of a fablous era in Australian Motor Racing. 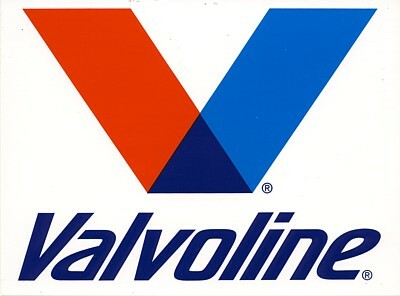 now V8 Super Cars. - $ 50 + P&P. 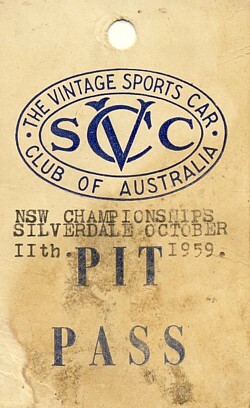 The first Australian Touring Car Championship was held in 1960 as a single race for Appendix J Touring Cars. 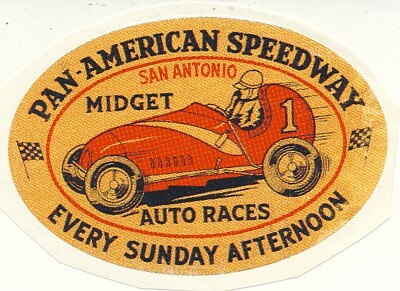 This was an acknowledgement of the rising popularity of races held for passenger sedans as opposed to the more purpose built open wheel racing cars, or sports cars. 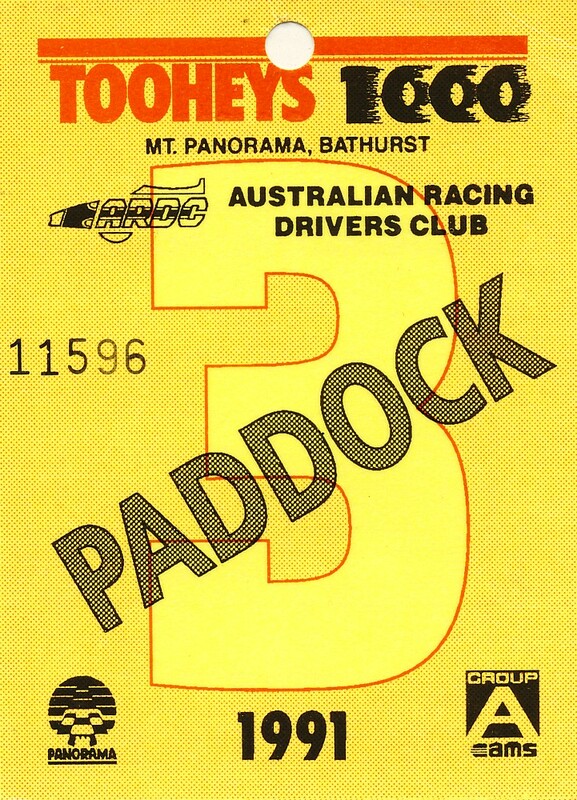 The original race was held at the Gnoo Blas Motor Racing Circuit in Orange in rural New South Wales, west of Sydney. 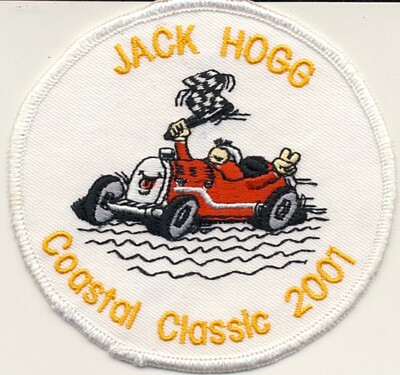 The original race was won by journalist racer, David McKay racing a Jaguar saloon prepared by his own racing team, which to this point had been better known for its preparation of open wheel and sports racing cars. 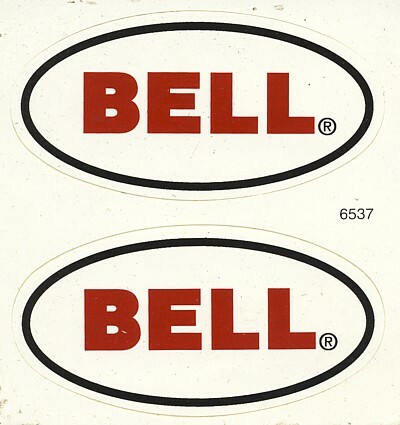 $ 10 ea. + P&P - 4 available. 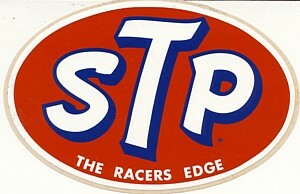 STP decal - small - 12.5 cm across. 2 x available - rare.